Editor’s note: The MudRatz ECSA Opti Race Team was created with the support of the Eastern Connecticut Sailing Association (ECSA) and the Mystic River Mudhead Sailing Association to help enthusiastic Optimist sailors in eastern Connecticut develop and improve their sailing and racing skills. 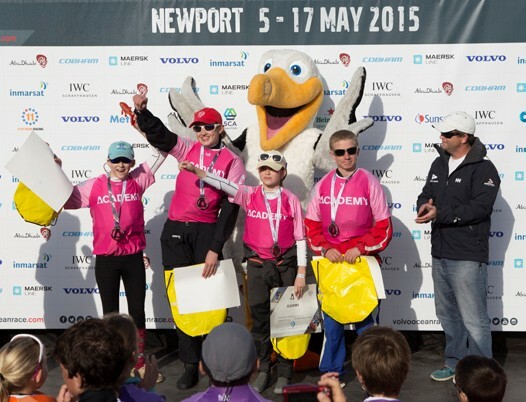 In May, the team traveled to Newport, RI for the stopover of the Volvo Ocean Race 2014-15. MudRatz Megan Gimple, Lily Flack, Kristen Healy and Stewart Gurnell fleet raced and team raced in the VOR Academy, met the race teams and toured their Volvo Ocean 65s, and went for a ride on a high performance Marstrom 32 catamaran. 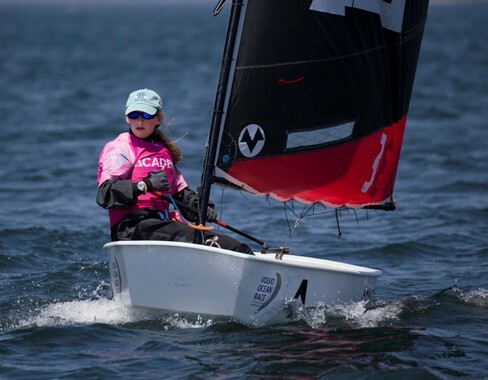 Inspired by the creation of the all-women’s Team SCA, Megan Gimple has followed the race since before it started, and she spent six days in the Race Village at Fort Adams State Park. Having met the young guns of Rhode Island’s own team, Team Alvimedica, when they visited Newport last summer, she wasn’t about to miss their homecoming. Going to the Newport Race Village was like the Super Bowl for sailing, a once-in-a-lifetime experience. During the week the boats arrived I visited six times, from skype calling with Team Alvimedica Skipper Charlie Enright at the IYAC to sailing in the Volvo Ocean Race Academy and finally a MudRatz visit with Team Alvimedica. It was an experience I had been dreaming about since the Volvo Ocean Race started in the fall. One Wednesday, I got a text from my mom during the last block of school that read, “The boats are coming in tonight. Get home and pack a bag, it might be a late night.” She was at the village volunteering, and the buzz was that the first boats (Dongfeng and Abu Dhabi) were supposed to finish by 8pm, and Alvi, my favorite team, a little later. I got there by about 6 pm, and my best sailing friend Lily, her little brother and I walked around the Village, a small mass of orange excitement. Soon the sun was setting and we had found the perfect place to hang out. What we didn’t know was that it was the announcer’s platform. Using Musto flags as blankets and our backpacks as pillows, we dozed off. We woke when a roar of cheers came from the crowd and the announcers asked us to scoot over a little. Dongfeng came into view, with Abu Dhabi close behind. We raced from the finish line to the dock as soon as they crossed the line to get a good spot to watch them. By about midnight, Lily had to go home; she had school in the morning. But not me. I was infected with Volvo Fever and I was going to be there when Alvi arrived! The last two miles of the leg took more than two hours to sail. It was 3:36am but I was there, cheering and waving an orange foam finger. I did not care about where they placed – only that they were back home in Newport.